The Democratic People’s Republic of Korea and Republic of Korea first compete together under the unification flag at the Sydney Olympics in 2000. On January 20 the International Olympic Committee (IOC) formally accepted the proposal from the Olympic Committees of the Democratic People’s Republic of Korea (DPRK) and the Republic of Korea (ROK) for Korean athletes to march in the opening ceremonies at the 2018 Winter Olympic Games in PyeongChang on February 9 under the Korean Unification flag. 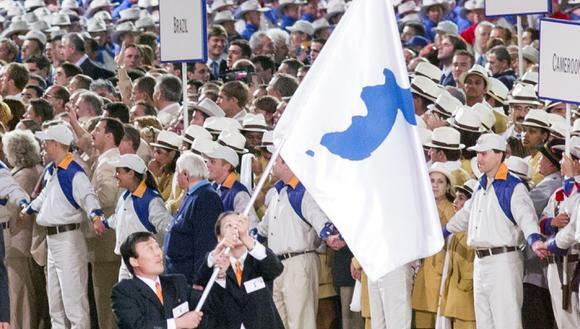 Athletes from Korea marching in the ceremonies will wear a special uniform with the flag on it. Korea will also have one unified women’s hockey team, the first time the two National Olympic Committees have formed a unified sports team. The above photo comes from this Nick Faris story on the oldest hockey rivalry in the world: Queen’s University vs. Royal Military College, dating back to a wintry afternoon on Kingston, Ont.’s frozen harbour in 1886. The animosity has endured for 132 years, through arena fires, Stanley Cup challenge games, off-ice mischief and a whole lot of losing seasons on the part of RMC of the Department of National Defence, which trains officer cadre for the Canadian Forces. The svelte, century-old uniform seems to be an improvement on today’s expensive, padded armour! It raises the question: when did the private NHL owners introduce “goon hockey” and to what end?